Sometimes in life you come across stories of people that leave you speechless, in awe of how they have chosen to live their life, full of respect for the journeys they are making and smiling at the effect they have had on people. Josephe Capeille was one such chap and, after hearing about him from the roadside in China, I wanted to share with you what little I could find on him. The few pictures that Google threw up on searching, show a travelling man, sunkissed and weathered, impressively bushy sideburns framing his smiling cheeks. Silver haired and a picture of health and fitness, Josephe Capeille looks like the sort of guy everyone would love to meet on the road and who, once met, would never be forgotten. I wonder if, after watching the video, you will change your plans for retirement, if indeed you have any? Hearing the story of Josephe Capeille certainly made me wonder about how I’ll spend those years of my life and confirmed that you are never too old to chase your dreams. Big respect, Monsieur Capeille – yours was a mighty journey and an extraordinary life. PS: Gao still here and going strong, though he’s often to be found with his head on his arm after eating at cafes et al, fast asleep and tired from the road. I’ve come to realise there isn’t much that selotape and Gao’s determination can’t deal with. Hi again Sarah. You certainly meet some remarkable people on your journey. I look forward to reading your stories. Am still suprised that you let Gao travel with you. He could slow you down quite a bit. Do not know whether you are behind schedule or have time to spare. perhaps you will let us know when you expect to arrive At your east coast destination with Gao. I guess that is when you say farewell to him. Anyway good luck and hope the weather gets a little cooler for you. Love Peter Nottingham. I think it is alyways the people you meet and share experiences with that make life special. I am gald that you allowed Gao to join you on part of your amazing journey……sometimes life is too short to be in a hurry! Looking forward to your next story and yes I am thinking what I will do when I retire or should I wait that long? Wow. 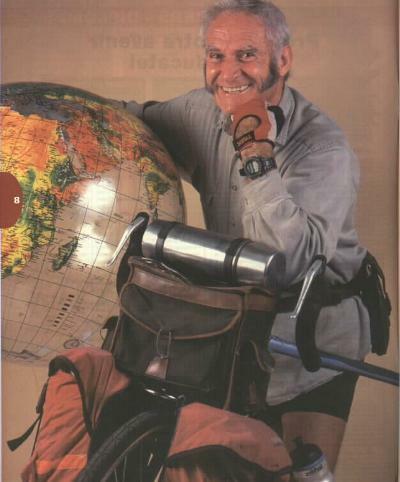 So Joseph did 250,000 kilometers on bike and rode through more than 220 countries and went around the world 5 times. 85 years old! Wow. That makes me just so happy to read about people like this and love my bike even more to do a trek like that. WOWO! Cheers to the journey and keep in the flow!! What an amazing story! Great Traveller! Thank you Sarah! Glad to hear Gao is still going. I think it’s the people you come across that are making this journey so special. Gao is just coming to Beijing. Now 1500km away – two weeks pedalling, I hope. I then continue up to the Russian coast alone.